1. Put the butter in a pan over a medium heat. Once foaming, add the apples, vinegar, calvados and sugar. Cover the pan with a tight-fitting lid and cook for 25 minutes, shaking the pan occasionally to prevent the apples from caramelising, until the apples are soft. 2. Once soft, transfer the apples to a tall container and blitz, using a hand blender, to a smooth purée. 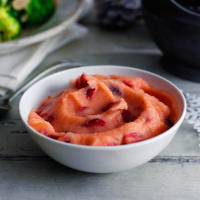 Transfer the apple purée back to the pan and add the cranberries; place over a low heat and cook for 5 minutes. Just before serving, add a dash more cider vinegar to taste.